Before you became a Christian, Satan and the world gave you an identity. They told you that you were a drunk, or a druggie, or a loser, or ugly, or someone who could never get anything right, or someone who thinks they are better than everyone else. Therefore, that is exactly how you lived, because that’s who you thought you were. Now, if you are a Christian, you have a new identity because you are a new creation in Christ. It doesn’t matter what you used to do or what people called you. That is no longer who you are! You have been adopted by God into His family because you chose to make His Son, Jesus Christ, your Savior and Lord. In Christ, you have His wisdom, righteousness, sanctification, redemption, and forgiveness. God wants you to realize who you are and use what you have in Christ. In Christ, you are no longer what the world or Satan says. When you become a believer, God transfers you from the kingdom of darkness to the Kingdom of Jesus. You become a child of God, a branch on the true vine, accepted in the beloved, and more than conquerors through Christ Jesus. That is the manner in which you are to think and act. Unfortunately, many believers continue to act out of their old identity, instead of realizing who they are in Christ and acting out of their new identity. Instead of living like the children of God, they live like the children of the devil that they were. Before you became a Christian, you belonged to Satan’s kingdom, and you were under the authority of Satan. He had the right to do anything he wanted to in your life. But when you became a Christian, you were transferred into the Kingdom that belongs to Christ. You are no longer in Satan’s kingdom, and you are no longer under his authority. The only authority Satan has to operate in your life is the authority you give him! Therefore, we can no longer truthfully say, “the devil made me do it.” We have been freed from the authority of Satan. We now have authority over him in Christ. We have no excuse to continue sinning. Truthfully, we choose to sin. And there are serious consequences for deliberately choosing to sin after receiving the knowledge of the truth. For if we go on sinning deliberately after receiving the knowledge of the truth, there no longer remains a sacrifice for sins, but a fearful expectation of judgment, and a fury of fire that will consume the adversaries. Anyone who has set aside the law of Moses dies without mercy on the evidence of two or three witnesses. How much worse punishment, do you think, will be deserved by the one who has trampled underfoot the Son of God, and has profaned the blood of the covenant by which he was sanctified, and has outraged the Spirit of grace? For we know him who said, “Vengeance is mine; I will repay.” And again, “The Lord will judge his people.” It is a fearful thing to fall into the hands of the living God. As a believer, we are now property of Jesus Christ. He has authority over us. In this relationship, there is peace and joy and forgiveness of sin when we repent. Repentance is not a one-time act, but a moment by moment walk by the Spirit and not by our flesh. When we fail, we confess our sin, receive forgiveness, and begin walking in repentance again. As obedient children, do not be conformed to the passions of your former ignorance, but as he who called you is holy, you also be holy in all your conduct, since it is written, “You shall be holy, for I am holy.” And if you call on him as Father who judges impartially according to each one’s deeds, conduct yourselves with fear throughout the time of your exile, knowing that you were ransomed from the futile ways inherited from your forefathers, not with perishable things such as silver or gold, but with the precious blood of Christ, like that of a lamb without blemish or spot. There are two sides to the cost of redemption. One side is that someone is set free by the payment of a ransom. The other side is that this someone, who is redeemed, becomes the possession of the redeemer. When Christ redeems us with His blood, we are set free from the authority of Satan. We are forgiven. We were bought and paid for by the blood of Jesus, and now we belong to Him! Therefore, we are to adopt His identity and do as He desires. Therefore, as you received Christ Jesus the Lord, so walk in him, rooted and built up in him and established in the faith, just as you were taught, abounding in thanksgiving. See to it that no one takes you captive by philosophy and empty deceit, according to human tradition, according to the elemental spirits of the world, and not according to Christ. For in him the whole fullness of deity dwells bodily, and you have been filled in him, who is the head of all rule and authority. If Jesus is our Lord, we cannot live any way we want to, or do anything we want to. We are not our own. Our spirit, soul, and body have been bought with a price. Christians don’t have any wants, goals, or rights! We gave all that up to Jesus when He redeemed us. We only have His wants, His goals, and His rights! Satan would love for us to retain the identity of our old life and continue to act that way. When we start to walk in the Spirit, he loves to point back at our old life and say, “Why you’re not anything. You’re a drunk, a liar, a gossip, sexually immoral, a failure, a whatever.” And the truth of the matter is, we used to be exactly that. But then Jesus became our Lord, and those things were forgiven. We died to our old life through baptism and we were raised with Christ to live a divine life by the power of the Holy Spirit. Therefore, we were given a new identity! We are children of God and we are to live for Him, His purpose, and His glory. If then you have been raised with Christ, seek the things that are above, where Christ is, seated at the right hand of God. Set your minds on things that are above, not on things that are on earth. For you have died, and your life is hidden with Christ in God. When Christ who is your life appears, then you also will appear with him in glory. Put to death therefore what is earthly in you: sexual immorality, impurity, passion, evil desire, and covetousness, which is idolatry. On account of these the wrath of God is coming. In these you too once walked, when you were living in them. But now you must put them all away: anger, wrath, malice, slander, and obscene talk from your mouth. Do not lie to one another, seeing that you have put off the old self with its practices and have put on the new self, which is being renewed in knowledge after the image of its creator. Here there is not Greek and Jew, circumcised and uncircumcised, barbarian, Scythian, slave, free; but Christ is all, and in all. Put on then, as God’s chosen ones, holy and beloved, compassionate hearts, kindness, humility, meekness, and patience, bearing with one another and, if one has a complaint against another, forgiving each other; as the Lord has forgiven you, so you also must forgive. And above all these put on love, which binds everything together in perfect harmony. And let the peace of Christ rule in your hearts, to which indeed you were called in one body. And be thankful. Let the word of Christ dwell in you richly, teaching and admonishing one another in all wisdom, singing psalms and hymns and spiritual songs, with thankfulness in your hearts to God. And whatever you do, in word or deed, do everything in the name of the Lord Jesus, giving thanks to God the Father through him. Are you living that way? We cannot live this way unless we are born again of the Holy Spirit, because we inherited a sin nature and we cannot do anything about it. The good news (the Gospel) is not that Jesus Christ took on Himself our fleshly sins, but that He took on Himself the heredity of sin, redeemed us by His Blood, and gave us His heredity, the Holy Spirit and His righteousness. God made His own Son “to be sin” that He might make the sinner into a saint. 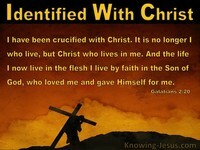 Our Lord took on Himself the sin of the world through identification with us. He became one of us and deliberately took on His own shoulders, and endured in His own body, the complete, cumulative sin of the human race. By identifying with us and our sin, Jesus Christ reconciled the human race, putting it back to where God designed it to be. And now anyone can experience that reconciliation, being brought into an identity—an oneness with God, on the basis of what our Lord has done on the Cross. The inescapable, spiritual need each of us has is the need to make a moral verdict against the nature of sin; that is, against any claim I have to my right to myself and what I want to do. 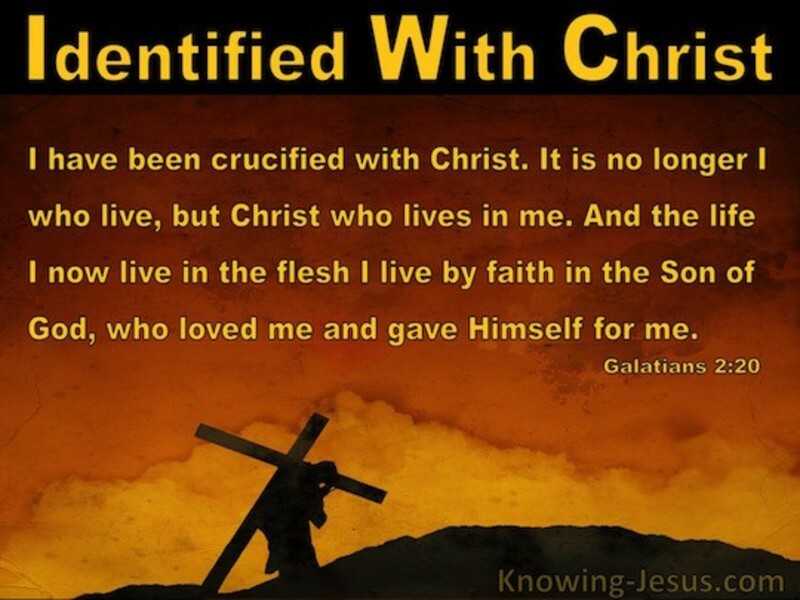 In other words, it is dying to self and living for Jesus. Once I reach this moral decision and die to self, all that Christ accomplished for me on the Cross is accomplished in me. My unrestrained commitment of myself to God gives the Holy Spirit the opportunity to grant to me the holiness and character of Jesus Christ. “…it is no longer I who live….” My individuality remains, but my primary motivation for living and the nature that rules me are radically changed. I have the same human body, but the old satanic right to myself has been destroyed. “…and the life which I now live in the flesh,” not the life which I long to live, or even pray that I live, but the life I now live in my mortal flesh—the life which others can see, “I live by faith in the Son of God….” This faith is not some logical conclusion we reach mentally. It is a faith in Jesus Christ that God graciously gives us. It causes us to die to self and live for Jesus. For it is by grace you have been saved through faith. And this is not from yourselves; it is the gift of God, not by works, so that no one can boast. Faith is not mental assent; that is, it is not agreeing mentally that Jesus is the Christ and then living as your own lord and doing what you want. That kind of faith is as useless as a screen door on a submarine! The demons have that kind of faith. They recognize Jesus is the Christ and they tremble, knowing their faith won’t keep them out of Hell because they still serve Satan. Therefore, some of you need to be trembling, because you are still serving Satan by doing what you want instead of living by the Word of God. Saving faith, that is a gift from God, causes you to die to yourself and live for Jesus because you recognize He is Almighty God, Eternal Judge, King of Kings, and Lord of Lords! By faith, you realize Jesus is entitled to your life and your obedience and you desire to serve Him in everything you do and say. This God-given faith in Jesus Christ dies to self-rule and does what Jesus Christ says to do. You have heard a lot of the Word during the last couple months about your identity in Christ. You may like the sound of the blessings, but do you believe it enough live that identity? Have you repented of your sin and being your own boss? Have you asked our Father daily for grace to die to self and be filled with the Holy Spirit? If you have just listened to these messages and done nothing but feel good about them, then you are deceiving yourself into thinking your relationship with God is OK. That good feeling will quickly pass as you forget what you heard. Therefore, whatever you hear God saying to you this morning, have faith in Jesus Christ and do what He says. Don’t delay. Begin that death to self today. Identify with Jesus Christ—crucify that sin nature every day—and start living in obedience to Him, His Word, and the Holy Spirit. Maybe He is telling you to believe in His Son, Jesus, and to confess your faith publicly by coming to the front of the church. Maybe He is telling you to follow Him in baptism so you can die to your sin nature and be born again of the Holy Spirit. Only then you will be a child of God with a new identity in Christ.